Ahmedabad-based mobile tech startup focused on social enterprises Awaaz De Infosystems Pvt Ltd, an incubatee of IIM Ahmedabad's tech incubator CIIE (Centre for Innovation Incubation and Entrepreneurship), has raised an undisclosed amount in angel funding from a group of angel investors, the company said in a release. Mumbai-based angel investor Samir Shah who has over two-and-a-half decades of investment experience in global markets based out of New York and Hong Kong led the investment around. He currently advises on the investments of the Sattva Funds and a founder director of the Sattva Asia Opportunities Fund, which invests in listed assets and unlisted assets in Asia across asset classes, with a primary focus on India. Prior to forming Sattva in 2004, Shah worked as executive director in the fixed income currency and commodities division at Goldman Sachs Asia. CIIE, which provided seed funding to the startup in 2012, also participated in the round. The company did not provide information on other investors. 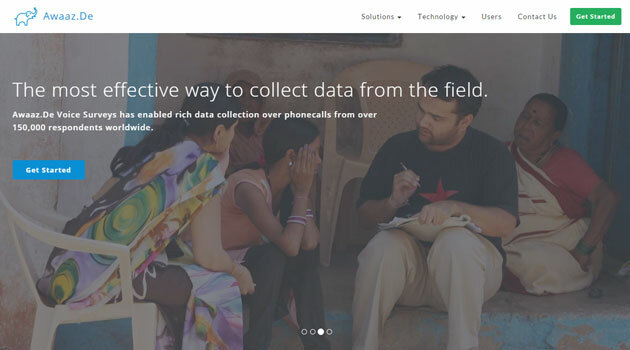 The firm, which operates under the brand of Awaaz.De, offers group voice messaging dashboard, localised content and data tools for areas like agri, education, health and other social projects besides field data collection over the phone. Founded in 2010 by Neil Patel and Tapan Parikh, who have over 15 years of combined experience in design and deploying knowledge sharing systems, Awaaz.De provides customised enterprise-scale solutions for organisations to better communicate with their customers and stakeholders through text and voice messages. It has hosted over 1,00,000 callers since beginning of the firm. "These are exciting times for Awaaz.De as we grow and diversify our customer base in India and abroad, collaborating with like-minded organisations and leveraging our expertise and the immense potential of ICTs for social impact," said Patel.